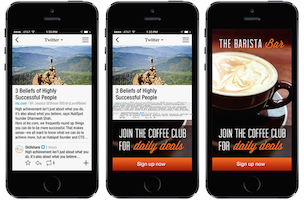 AllTwitter: Coming soon to a Twitter feed near you — native ads! Get excited people. This is what life is all about. GalleyCat: Alicia Silverstone has written a parenting book which contains plenty of good advice because she’s marginally famous. AllFacebook: A study found that Facebook users really enjoy checking-in at the Grand Canyon. Makes sense. It’s not like there’s anything to see there, might as well be browsing Facebook.